Published by Inanna Publications, May 1, 2010. You can order the book:online from www,alllitup.ca Or support your favourite bookstore and ask for a copy. 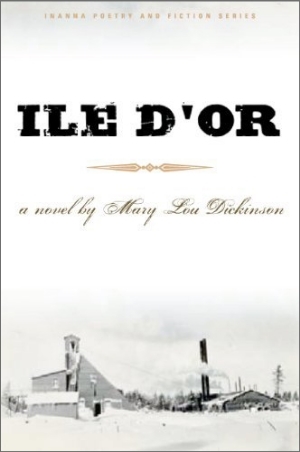 Ile d’Or takes place shortly after the first referendum on Quebec separation. Four forty-somethings encounter each other in Ile d’Or, the town where all of them grew up. These intriguing characters are emerging from a frontier existence and moving into late twentieth century society. They must discover how their contemporary lives connect with their pasts and how those lives have been shaped by growing up in a Northern Quebec mining town in the 1930s through the 1950s. With a storytelling style that skillfully combines the fragility of the human condition with the rock-hard reality of life in a northern mining town, Dickinson threads together the lives not only of miners and their bosses, but also the larger social fabric of a Quebec mining town on the heels of the province’s failed 1980 independence referendum.